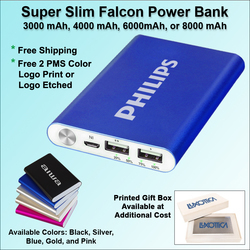 Super Slim Falcon Power Bank with dual ports and power readout. Stylish slim aluminum finish, approximate size: 4.58” x 2.75” x .5”. Available in different capacities: 3000 mAh 4000 mAh, 6000 mAh, or 8000 mAh. Includes Micro USB to USB connector to charge the power bank. Colors available include: Blue, Silver, Gold, Pink or Black. Charge your Mobile device while you are on the go with a power bank. Price includes FREE 2 pms color logo print or logo etched 1 position. . FREE Gift Box, FREE SHIPPING to one address. Grade A Battery with 12 month warranty. FREE Shipping, FREE Gift Box, FREE set up on orders of 300 or more. Under 300 - Setup Charge: $55.00 (G) Cost per additional PMS print color/location $0.17(C), FREE 1 PMS logo print.